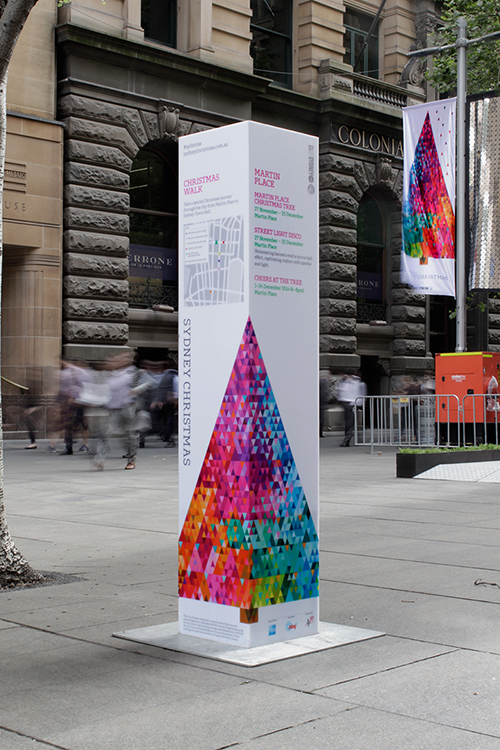 The City of Sydney local government area has begun rolling out this year’s Christmas branding, in a six-week campaign that will cover the CBD and surrounds in festive spirit across the spectrum of outdoor, digital and print media. Created by local brand and design studio, HOLT, the campaign creative centres on the clean-lines of a triangular, tree shaped identity, as the contemporary distillation of a recognisable Christmas motif. The ‘tree’ itself is further made up of hundreds of smaller, prismatic triangles in a myriad of bold, rich, jewel-like colours. As though in flux from a gust of wind, small ‘leaves’ of colour are blown from the tree shape, into its surrounds. 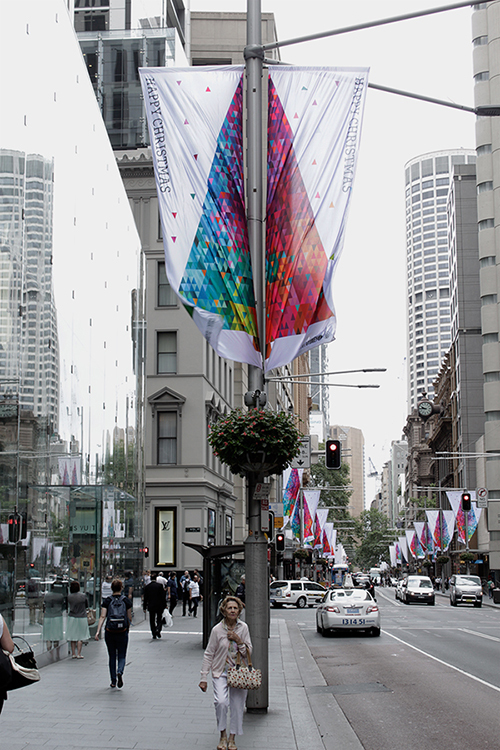 “The 2014 Christmas campaign will be highly visible throughout inner-Sydney via city flags,” said Christopher Holt, creative director at HOLT. “This got us thinking about how to utilise the nature of the medium to augment the creative and give it life. The notion of wind was the basis of this idea. The use of a palette of more the 350 individual colours was also developed with clear intent and careful thought as to how the creative could positively influence the emotional experience of being in the urban landscape of the City of Sydney during the Christmas period. Holt said the use of colour aims to create a joyful sense of celebration and a festive mood amongst city-goers. 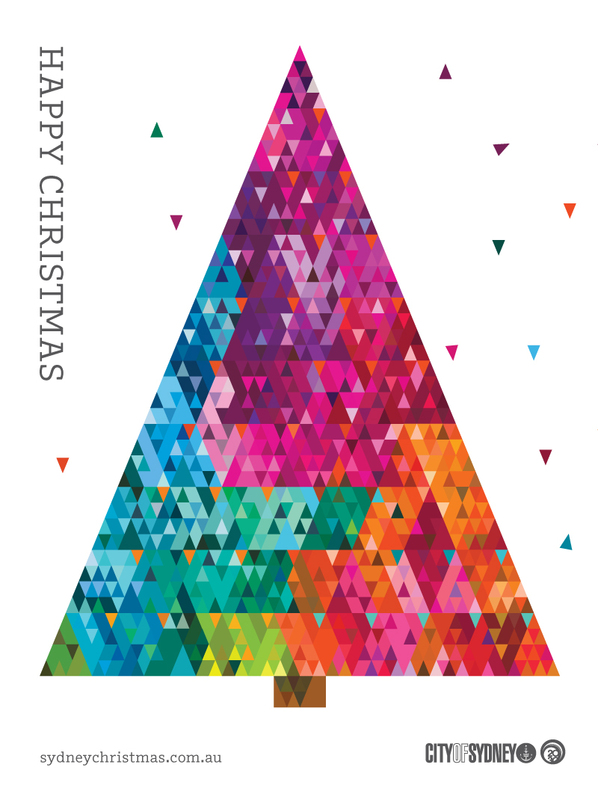 The campaign, which represents the commercial activations and community celebrations of the 2014 Christmas period in Sydney, will cover the city as it rolls out across metrolights and citylights, city flags, banners, large-scale outdoor billboards, posters, print and online advertising, website, promotional collateral, experiential executions, digital applications and retail activations. Steve Howlett, head of creative at the City of Sydney, whose in-house team will roll-out the creative, says the annual Christmas brand and campaign is integral to the City’s standing as Australia’s only global city.